Mordian 7th Regiment: 40k Adeptus Mechanicus - Magi painting begins! Not entirely switched over to the summer schedule yet, so only getting a little painting done in the mornings before work while I adjust to getting up earlier than usual. Nevertheless, pressing onwards and laid in the base colors for the two Magos models! 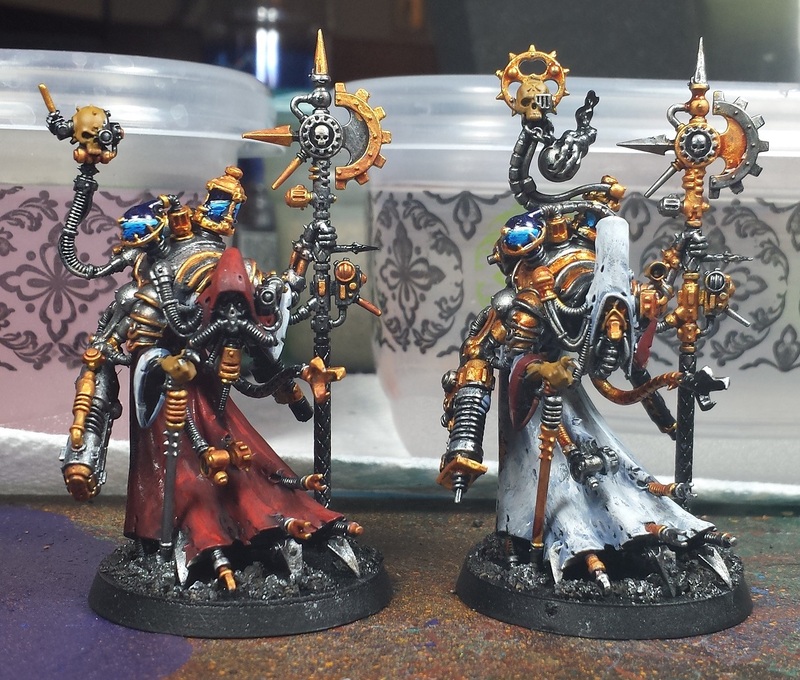 As envisioned earlier, red robes on the magos dominus and white for the archmagos. I also decided to take a whack at reversing the gold/silver on them as well, with the archmagos being predominately gold with silver trim to go along with the white robes. Still a ways to go yet, but so far, so good! In other news I'm due to get my main cogitator back at the end of the week, praise be unto the Omnissiah! Looking great so far. I really like the effect on the liquid/lightning in the tanks... perhaps a tutorial some time? Those are awesome minis, paint is great too. The only downside for these i guess it, as you said earlier, the lack of positioning options and the difficult job of conversion if you should want that. Really looking forward to getting my hands on this one though. Good job with the paint scheme making them look different. The only idea I could say is try turning one of the heads a different direction and swapping out the pimp cane. I think that would make a big difference. I love the fabric in both of them. In particular the white one is full of texture that really evokes the grimdark source imagery. I'm not sure how you've done it but given how these are plastic and most cloaks are super smooth to get such texture in the material is amazing. It doesn't quite look like drybrushing as the grain would be much smaller but please correct me if I'm wrong, or let me know how it was done. Also your metallics really look at home on the admech. Those boys look great sir. Do like how you've gone for the mirror image effect. One of them should be holding a cup of tea, whilst the other smoking a cigarette. Great concept on the reversing. Results in a really cool look! Really great work. Your paint schemes are bringing out the character of the models very nicely. I like the effect of the fluid in the canisters too. they are going to look brilliant when finished!!!! Great work, hopefully with your main cogitator back you'll enjoy the noosphere more. @Manus: Aye, it's a great kit. Definitely scheming on getting another one to hack up and re-pose! @Rory Priest: Indeed - The head is basically molded to only go on one way, but with a touch of greenstuff one could definitely open up the pose. @Dave Weston: Thanks man! It is all drybrushing, but I went at it with a pretty gnarly brush with the two lighter greys which gives it a bit of stippling at the same time. The cloaks do have a surprising amount of sculpted texture as well - they've definitely been fun to paint! @Dai: Haha! That would be perfect! @Pawn Cocktail: Cheers, bud - GW really hit it out of the park with this sculpt! @Zzzzzz: Indeed! Posting from the phone has not been ideal. Curse them jamming the head on there like that! I was tempted to try Tzeentch up one of those into a twisted Thousand Sons warpsmith who delights in making daemon engines. Think it is doable with the kit? @Rory Priest: That sounds like a great idea, man! The kit has a ton of personality, and with a little cutting and greenstuff I'm sure there's some fantastic conversion potential! Man these tech-priests are sick. Great paint job. I took a break from 40K and all this awesome mechanics stuff came out. I knew you would hop right on them!